Nestled snugly in a quaint little corner of Co. Down, N. Ireland, lies Scolban shoot. Within a 20 mile radius of Belfast City, the shoot comprises of some 600 acres of mixed and varied cover, ranging from virtually impenetrable wild briars and bramble, severely punishing gorse, thick rush and boggy swamp land, to densely overgrown hedgerows comprising of ash, beech, oak and unforgiving blackthorn. Quality of shooting tends to be the order of the day, taking precedence over the numbers game, where a bag of around 25 birds is looked upon as a pretty good day’s sport. Camaraderie coupled with a friendly atmosphere are always at a premium on this smaller shoot, where everyone pulls together as a team with one single purpose and aim in mind; that a good day’s sport is had by all. 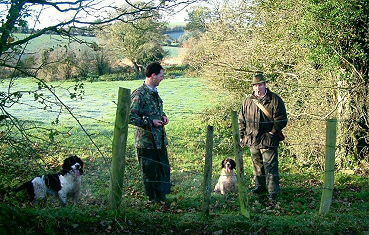 These types of smaller shoots are ideal to introduce a young dog to the shooting field. Less commotion and much less hectic than the big 200+ bird shoots, they offer excellent opportunities to give a young dog valuable experience. With fewer distractions and not as many claims being made upon dog and handler, they are an ideal medium for a young dog to find his feet and prevent him from boiling over in the heat of the action. I had a youngish cocker dog with me that I am training for a customer. He is fairly well on in his training, but needs to up his game re: hunting. He was there to prove me wrong and show me he could indeed hunt better when given the opportunity on hot scent and a goodly supply of game. He didn’t! Parcels of select cover can be found where the young dog can come into contact with enough action to make him raise his game, but not enough as to drive him to distraction and over the top! 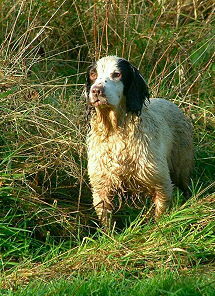 Most large shoots can have 20-40 dogs - both spaniel and retriever - vying for space and busying themselves. Running in packs at times the noise and furore can reach a boiling point and cause many young dogs to react in a negative fashion. 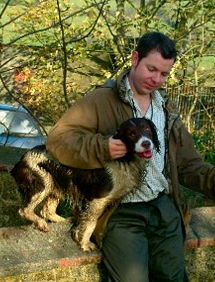 Whereas the smaller shoots such as Scolban allow the handler to "ease" the dog in and try as best as possible to maintain a high degree of control and obedience. Spaniels that will face hard punishing cover are vital on these type of rough shoots where one moment a dog may be required to work out rush and white grass, but the next, have to take a wickedly punishing hedgerow apart. Dogs that try to skirt cover and haven’t their heart in attacking seriously testing cover are best hunted elsewhere! Sport on the day consisted of wily Michigan crosses, red-legged partridge, snipe, woodcock and the occasional duck. Rabbit numbers up and down the length of Ireland have seriously gone into decline over the past five years, with many shoots seeing virtually none where they would have been numerous. Many spaniel trainers are finding it increasingly more difficult to find adequate supplies of rabbits to give their dogs experience on and to steady them. There still are the odd pocket of rabbits to be found here and there, but it is very far from the norm! One thing I did notice on my visit to this delightful shoot was that the majority of dogs were overweight and could have been fitter. No doubt a follow on from dogs "getting things easy" during the closed season; lying up and not receiving enough exercise.! Dogs on show worked splendidly and handled the cover admirably, although at times steadiness to flush and shot could have been doing with a slight polishing! One old spaniel in particular, "Toby", who is now 16, is still enjoying life, if perhaps at a more moderate and leisurely pace. Stone deaf, he wouldn’t hear a pipe band if it were playing beside him, he can still work along with his handler as long as he can keep eye contact with the dog, where he responds well to body language. All goes well with Toby as long as both he and his handler keep in touch with one another; at times both go in opposing directions and things develope more into a game of hide and seek! Although getting well on in years, Toby’s eyes are as clear as a bell, his mouth is still 100%. He is in good health and enjoys his leisurely outings to the shoot. The day consists of a few "mini drives" where the guns are lined out and beaters and their dogs work out selected patches of cover and hedgerow, in the hope of flushing some birds over the waiting shooters. For such a small shoot, this technique works well and a lot of sport can be had. The remainder of the day consists of "walked up" shooting where dogs are hunted ahead of the shooters through varying types of cover from bracken to thick boggy rush land and small wooded areas. Birds flushed may be snipe, pheasants and woodcock. The dogs had to work hard to deliver sport on these patches with birds tucking in tightly and many being very jumpy and flushing well out of gun range. Cover at times can be above head height and as thick as it comes, requiring a lot of effort by both dog and handler, and making it very difficult for dog and handler to keep contact with one another. Quite a lot of beater’s dogs, although hard working souls and animals that have their heart in the job at hand, may not just be carrying as much polish as they ought, may pull ahead too far and not always remain steady to shot. However, their handlers may not be as uptight about maintaining absolute obedience. Although some dogs may suffer from selective hearing in regards to the whistle, they produce some super sport for the guns! I did take time to check out every bird that was shot and was pleased to find that not a single exhibit of hard mouth or damage was to be found! That was very encouraging indeed! 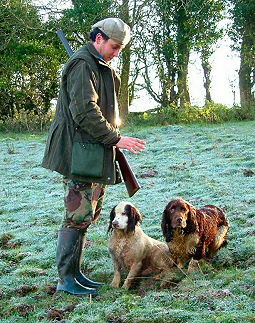 It never ceases to amaze me on shoots the wide and varying type and appearance of the spaniels on display. From small, short-legged dogs such as old Toby, to the larger heavily boned animal with an old fashioned wavy coat; to the modern day smooth coated flying machines. Not one looks similar in appearance apart from two floppy ears and a leg on every corner, yet all are spaniels, and all are carrying out their duties as best as they can. "Variety certainly is the spice of life!" 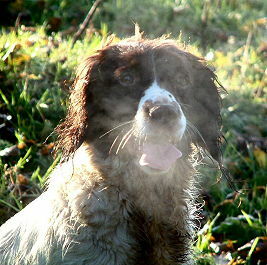 Nothing fittens a working dog more than working it on a day’s shooting in the field. I am sure the dogs on show will strip fitter the next time around! A good day was had by all... I look forward to a return visit there some day very soon!